So I finished my ring quest …. It doesn’t even have a fun effect. And it’s a ring, so you can’t see it … not like the cloaks with their visual effects. Oh well. 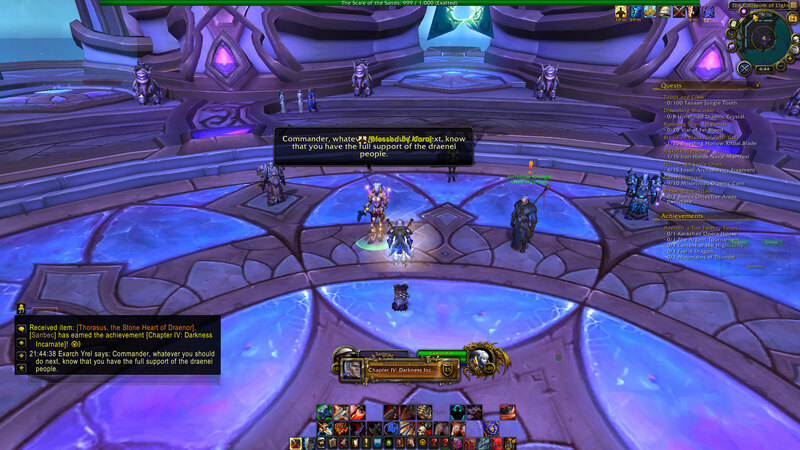 Now that I had the ring and its follow-up quest, I went in and killed Archimonde last night. I got lucky and zoned into a group that already had 5 stacks of determination, so it was a quick one-shot for me. I hung around and watched the cinematic and felt … nothing. 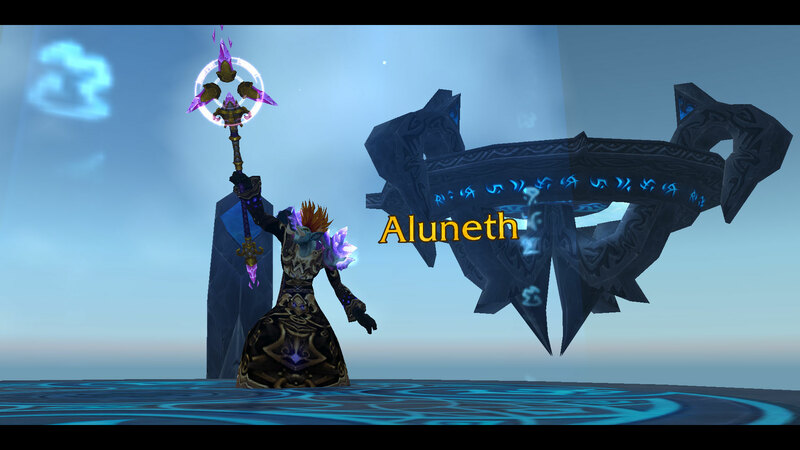 I thought back to the endings of the previous three expansions that I have been around to see. 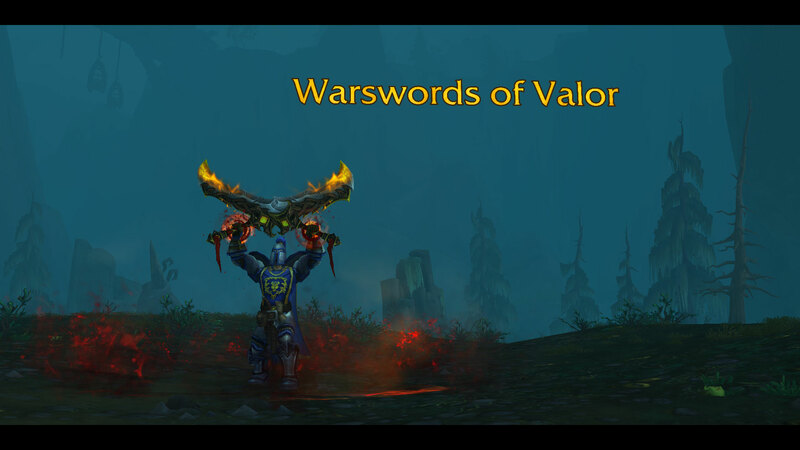 Garrosh … heck yeah it was exciting to finally put him in his place. Deathwing … that jerk ruined zones that I cared about and burned me to a crisp when I was just out and about trying to … ok, fine, trying to get burned to a crisp for the achievement, but still! 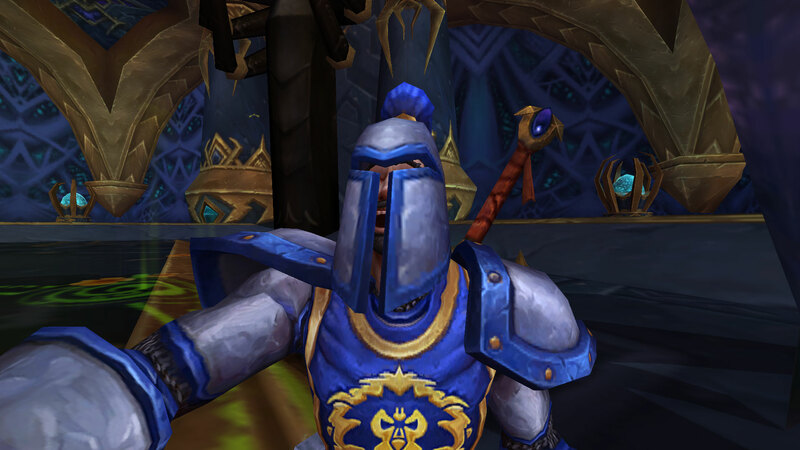 Arthas, the Lich King … man oh man. Killing him is still the most emotional and memorable experience that I have had in the game. This? Meh. I could care less. Except for this one, because she’s awesome. In this terrible screenshot, you can see me receiving the last Tome of Chaos that Sanbec needed to collect. That was also the last boss I needed to get the achievement for that wing, and it was nearly bedtime when we finally downed him, so I dropped out right after. What you cannot see is the 5 stacks of determination it took to down him. Although, from what I hear, it may take more than that to kill Archimonde, which I have saved because I’ve heard I will need to kill him for the next stage of the quest anyway. I didn’t even turn the quest in last night, I will do it tonight. Now on to actual fun stuff! Yep, I’m taking a screenshot instead of hitting Herald Volazj. I saw him so many times this past week I figured I’d earned a couple seconds of reprieve. 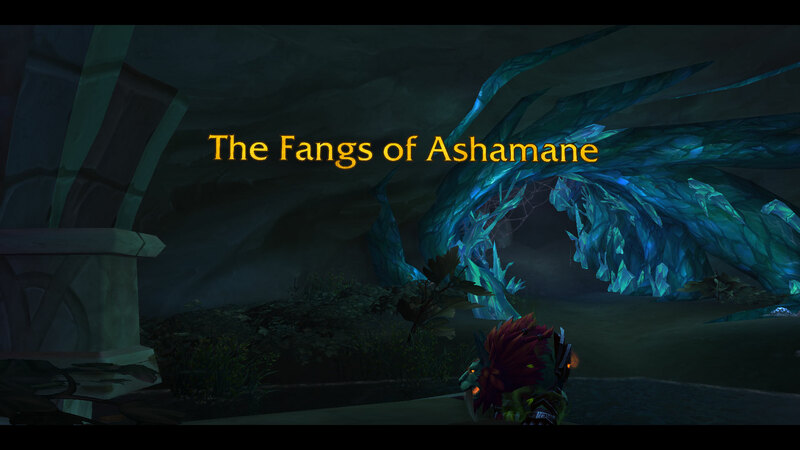 The bonus last week was Wrath Timewalking Dungeons. This was also the premiere of the badges that you earn in them. It takes 5000 to buy the super awesome horse that I absolutely must have. But I wasn’t going to get him in one week. I had other priorities, because you get a quest to turn in after finishing your first dungeon that awards 500 badges. With those badges, you can buy ilevel 675 gear for anywhere from 25-50 badges each. I figured it was a perfect and easy opportunity to gear up my other 5 max level alts. So they all did at least one dungeon. 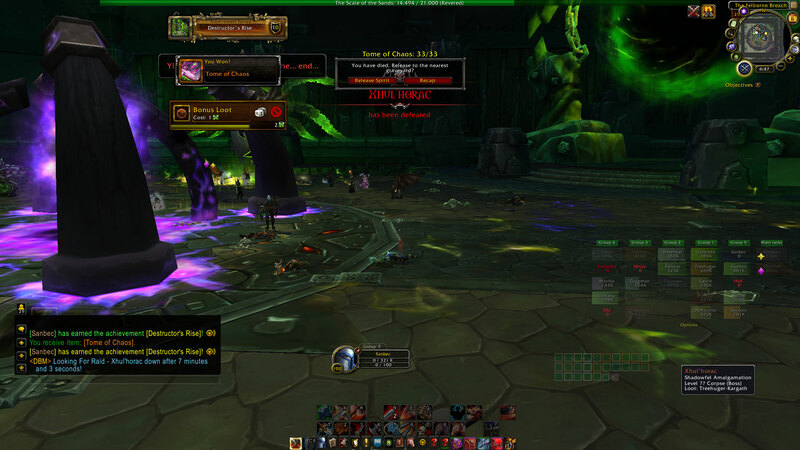 Karius was the lowest geared going in, not even able to queue for Draenor heroics, but since these scale you down to a set level, his actual ilevel didn’t matter one bit. Voila! Just like that and he is geared enough to queue for Hellfire Citadel … not like he’s going to, but he *could* if he managed to talk me into it. I think my two DKs are still one point off, but a little time in Tanaan would take care of that quickly enough if I cared. Next time, I won’t have to gear up alts, so Sanbec can just chain run them. And what a good time they were. 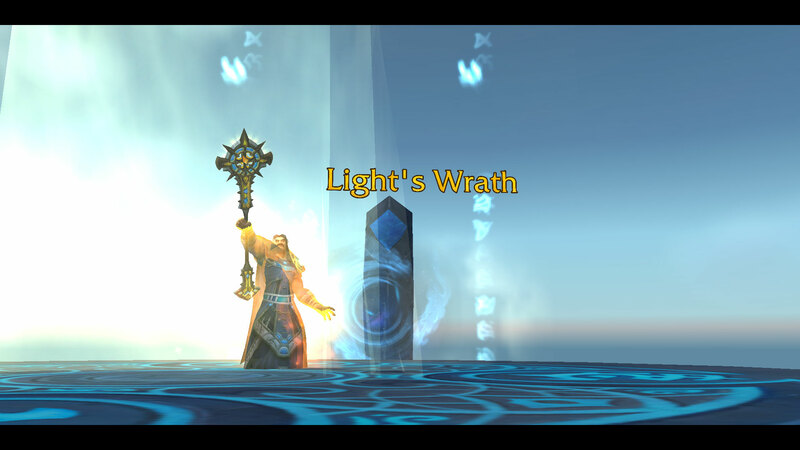 I did a few heroics at the end of BC, but Wrath is really where my true deep involvement in group play began. I will never love any dungeons as much as I love Wrath’s dungeons. Sure there were a few wipes along the way … people forget that you can’t pull too many things that fear or flamestrike. What was it with fear in those dungeons anyway? I think every single one has some in it. 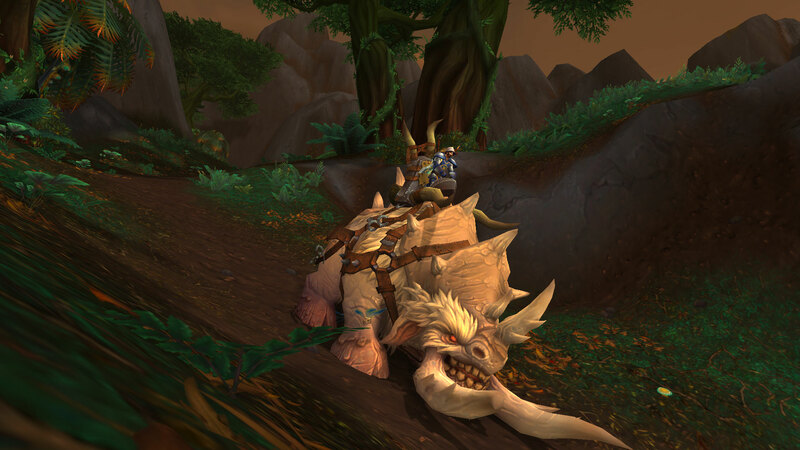 Anyway, it was great fun and I am looking forward to the next Timewalking event.